The Cotswold Stripe Relaxer from Glendale is a great quality garden relaxer that doesn't break the bank! The Cotswold Stripe design uses light green, cream and mid green stripes to create a calming look perfect to match any garden. 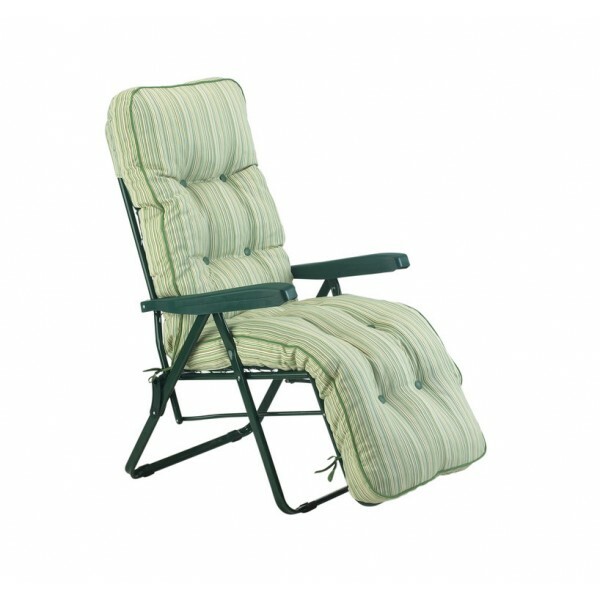 Supported by a sturdy green steel frame, the thick cushion has hand sewn piped edges and ties to hold it firmly in place. The heavy duty frame is multi positional and easily operated using the arm rests to maximise your comfort. When not in use the frame and cushion can be folded up to save space and store with ease. Matches with all items in the Cotswold Stripe Collection.